How to make date YYYY-MM-DD (ISO-8601) the default in Excel? 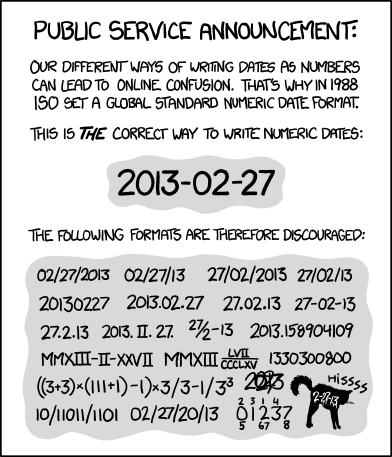 In Excel how can I make the ISO8601 date format, yyyy-mm-dd, the default? Windows locale is English(CA) or English(US). We're using Excel 2013, though a generic answer for as many versions as possible is preferred. Using a custom format as in How do I enter dates in ISO 8601 date format (YYYY-MM-DD) in Excel (and have Excel recognize that format as a date value)? doesn't work, because it needs to be repeated for every new field. This is especially painful when working with CSV files. There, choose for Short date the yyyy-MM-dd format, and done! Here's the proof it works. Even if you write another date format, Excel will automatically convert it to the system's default. Keep in mind that this will also change the way Windows displays the date. Set that format in windows regional settings. Excel will use system settings as default. For that you will have to go to Control Panel, choose "Clock, Language, and Region", and then "Region and Language". Click the "Formats" tab, and then, in the Format list choose "Short Date" and from the drop down list choose the appropriate option "yyyy-MM-dd". Not the answer you're looking for? Browse other questions tagged microsoft-excel date-time default-settings or ask your own question. How do I enter dates in ISO 8601 date format (YYYY-MM-DD) in Excel (and have Excel recognize that format as a date value)? As a US user, how can I change the default date format in Excel 2016 (Mac) to YYYY-MM-DD? What date formats does Excel recognize as dates? Why does Excel treat some dates differently than others? How can Excel dates default to short-date format when the year isn't typed?